Reading this in your email? For easier reading – Click here. Most of the time here at Green Mountain Timber Frames, we restore 18th and 19th century barns and turn them into new timber frame homes, barns, great rooms and more. 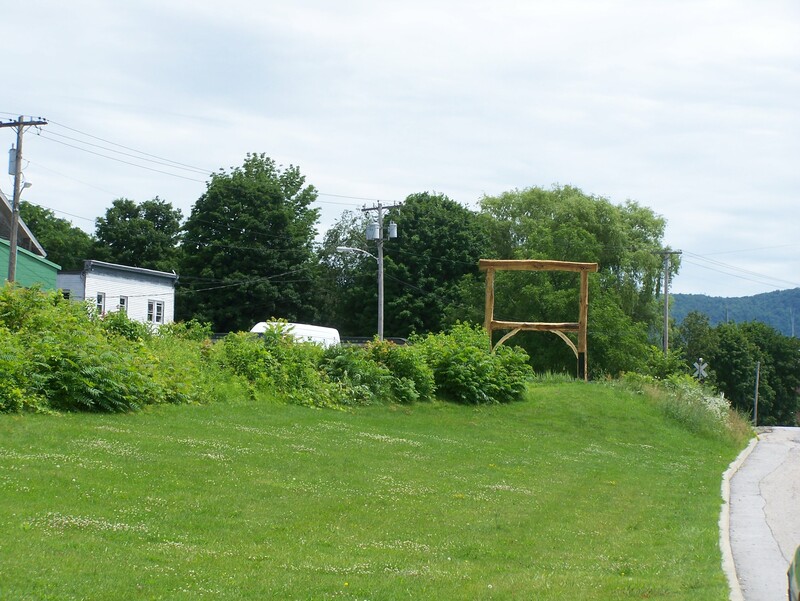 But this summer, just for fun, a different project came into the mix when I was asked to put together a very “organic” sign frame for Rutland County’s Vermont Farmers Food Center. Here’s the frame. The sign itself will be attached soon. You can still see the curve and shape of the tree in the two braces and heavy timbers. 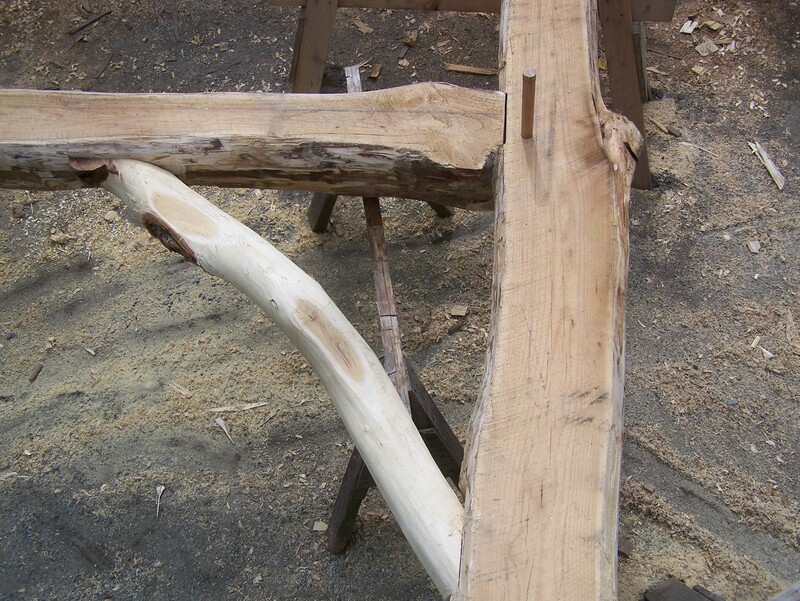 How does one make a timbered sign frame out of half round locust trees? To begin the process, I chose to use local locust wood. I found the logs at Ken Gagnon’s saw mill in Pittsford, VT. Armed with these rugged timbers, I was ready to begin building. I used locust because their wood is comparable to “pressure treated” wood. Locust naturally has many of the properties of pressure treated wood, without any chemicals needed to preserve the wood’s fiber. Remarkably, locust can easily withstand being exposed to the elements for 50+ years. Ken Gagnon sawed flat sides on the front and back of the sign timbers, making it much easier for us to do the joinery. I carefully studied the surfaces to decide the placement of each timber. 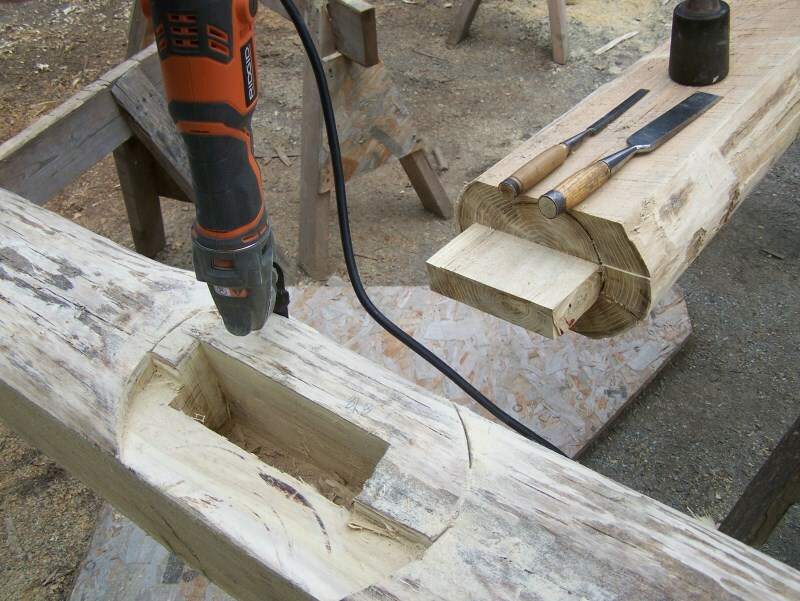 Because locust wood is very hard, we used a chain mortiser to make the mortises (pockets). This time-saving piece of modern equipment is very exact, and reduces wear and tear on our arms. 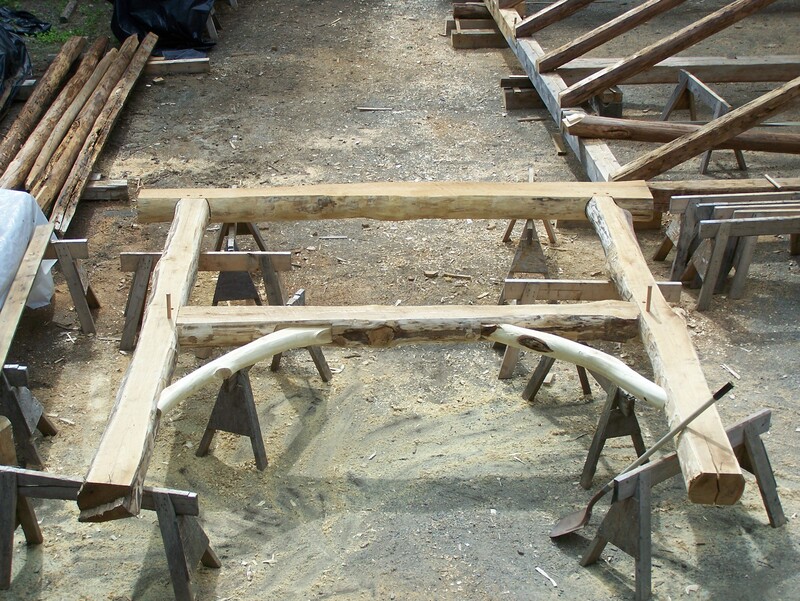 However, I still had to scribe and chisel the rounded sides of the four beams to make them fit together tightly when the joinery was completed. Expert timber framer Luke Larson works on joinery. Tools used in making a joint. We connected the beams using mortise and tenon joints. Once erected, this joinery allows the frame to be a very strong structure, even in heavy winds. Because the wood is locust, the joints won’t rot. As we were building the sign, I felt that adding in some locust limbs for the diagonal braces would enhance the look. Heading out to the woods, I found some locust trees. I cut some limbs that had natural curves. We pealed off the bark and eventually carved tenons on both ends of each piece. All in all, it was a fun project that took the Green Mountain Timber Frames team about 50 volunteer hours to complete. Interested in your own timber frame structure? Our main focus is on historic properties and timber frame homes, but we have other talents as well! Interested in furniture that compliments a timbered home or something else special? This entry was posted in Green Mountain Timber Frames, Timber Frame Projects and tagged Green Mountain Timber Frames, Post and Beam, timber frame, timber frame joinery, timber frame vermont, traditional building, traditional timber framing, vermont architecture, vermont barn home by Green Mountain Timber Frames. Bookmark the permalink. What is the size of this frame and how available is locust wood? Is it ever used for flooring? Janice, always good to hear from you. If squared, the locust timbers would have ended up 8x8s. it is no good for flooring. Too gnarly. A young craftsman made some outside furniture with it and the wood kind of exploded with the sun working it. It is reasonably available if you give the mill a half year notice when looking for bigger stock. I’ve used it in place of pressure treated sills. it seems to hold together when in bigger sizes. Making into flooring doesn’t seem to work. Altho I used 2 inch stock to repair a wooden silo. The sign frame ended up 10 feet wide, 12 feet tall. Eventually the timbers will turn black. The sign itself will be vertical barn board with white lettering. Really awesome project! I’ve got a couple large locust trees that may have to come down. Now I know that I can saw them into timbers and have some fun. Thanks! Brian Flanagan Wisconsin, USA. Brian, those locust would make good sills for a barn. The wood won’t mind the sandy soil if set on sauna tubes.